The counting chamber measuring 8 feet x 8 feet x 8 feet and is constructed of 10 inch thick cast iron, with a full graded-Z liner consisting of lead, tin and stainless steel. The Carlsbad Environmental Monitoring & Research Center’s has a fixed in vivo bioassay facility which occupies approximately 966 square feet, and provides the primary analytical infrastructure for the internal dosimetry program. This facility includes a large shielded counting chamber, dedicated instrument control workstation, two change rooms with showers and toilets, and a reception area. The counting chamber measuring 8 feet x 8 feet x 8 feet and is constructed of 10 inch thick cast iron, with a full graded-Z liner consisting of lead, tin and stainless steel. The cast iron composing the chamber was produced for industrial use prior to 1945, and re-cast for the chamber using a specially selected foundry, resulting in very low background radiation from anthropogenic and naturally occurring constituents. The instrument control workstation includes a video display terminal and intercom that are used to monitor subjects during the examination. Signal processing electronics are located outside the counting shield next to the instrument control workstation. 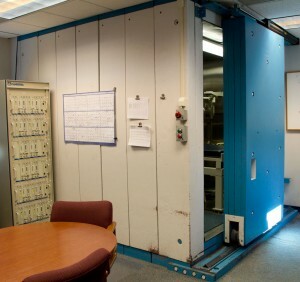 The in vivo bioassay facility was commissioned in July 1997. The counting chamber is equipped with a lung and whole body counting system using technologically advanced, hyperpure germanium detectors. The counting chamber is equipped with a lung and whole body counting system using technologically advanced, hyperpure germanium detectors. Lung and whole body counts are simultaneously performed with the counting subject lying horizontally on a specially designed counting bed. 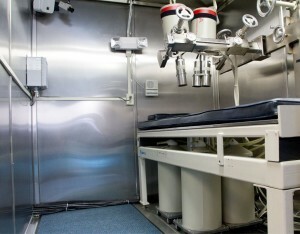 Two, four-detector germanium arrays designed for lung and whole body counting are positioned over the chest and under the bed, respectively.